Strong and sensible, WYPALL* X50 Wipers – our most economical extended use wiper picks up where the competition falls apart. 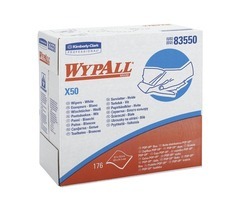 WYPALL* X50 Wipers combine versatile performance with economical design for light-duty tasks. Ideal for manufacturing, healthcare and transportation environments.